It's difficult for toy packaging to stand out in the aisles these days. And while the current Transformers Siege line has seen some the most radical departures yet (Deluxes in boxes? Madness!) their most intriguing feature is barely visible to the naked eye. If you tilt the side of Deluxe, Voyager, and Leader class boxes with the character art on it you can just make out hints of something that's "more than meets the eye". 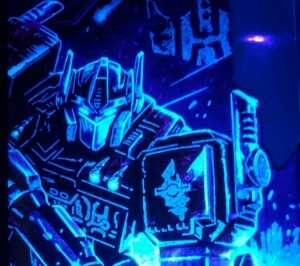 Thanks to Seibertronian Lunatic Prime and a UV light we're getting our clearest look at all the hidden details on Voyager Optimus Prime and Megatron's boxes. This goes beyond the "simple" hidden messages found on promotional Siege posters last year. Revealed under the right lighting not only do we get code words that can be used on the Transformers website (though strangely the code on Optimus Prime's box is written as "Lacon" instead of "Iacon"), but also several new character details, faction symbols, and the character's name at the bottom. But more than anything it's just a really cool feature! Got more examples of Hasbro's clever hidden art from the Siege line? Share them with your fellow Seibertronians in the Energon Pub forums below! So I really dig each “Prime” has his own silhouette. The Neme-Pax even has that lanky evil vibe. Was shocked their cabs all scaled decently. Bonus point. Magnus and PotP trailer scales too! My optimus and Megatron dont have this. They were picked up online when the first few showed up back in november. I dont know if it was just a fluke, or if some of those early wave figures just didnt have them, because a one friend got them early too, and he doesn't have it eithet, while another friend got his just a couple weeks ago, and they do have the blacklght bits. Immortal Starscream wrote: My optimus and Megatron dont have this. They were picked up online when the first few showed up back in november. I dont know if it was just a fluke, or if some of those early wave figures just didnt have them, because a one friend got them early too, and he doesn't have it eithet, while another friend got his just a couple weeks ago, and they do have the blacklght bits. Interesting. I wonder if we'll see a revision that corrects the "Lacon" lettering on Optimus Prime's Voyager box. This kind of stuff will sure drive completionists crazy. Wolfman Jake wrote: Honestly, Walmart is just a crapshoot nowadays. You're much more likely to find what you're looking for, sooner and more consistently, at Target. Yeah that reality has been a constant for a loooong while now IMO. I will say Walmart is still good to watch out for, just because I've had some rather interesting luck there. Mainly with the POTP stuff, but I've had the early stock before release Roddy Unicronus, the only place to get wave 2 Sludge and Snarl, and just released half priced clearance on OP and regular Roddy. Otherwise, Walmart so far has been rather disappointing as all of them I've been in do not have even a tag for Siege leaders, Studio Series, the trading cards, or Botbots. They've only had low quantities of the weaponizers and pegs full of deluxe class. TonTon Reviews just uploaded their review on Siege Leader Cybertron Optimus Prime. He actually goes into detail comparing the Siege figure with the original Cybertron version. Finally concluding our saga of leaks, today we received quite the shocking review of the yet-unconfirmed (by HasTak) WFC Siege Leader Class Optimus Prime, courtesy of TonTon Review! This serves as easily our most thorough look at the Unicron Trilogy-inspired Prime yet, as TonTon’s mechanical monologue goes into detail regarding the figures articulation, paint and mold detailing, vehicle modes, robot modes, weapons, Six-Gun compatibility and size comparisons against both Siege Deluxes and the Cybertron original! We also see some unfortunate things, such as the Super Mode head being visible in alt mode (upside down or not), and that the wheels must be partsformed when converting to robot mode. We also cannot understate how unusual this truly is, as not only has there been no reported sightings of this figure yet, but there has also never been an official statement directly from the mouths of anyone at either Hasbro or Takara even confirming this figures existence, let alone visage. This seems to suggest that some retailer may have accidentally released the figure early, in which case the hunt is most certainly on for Siege fans everywhere, or that TonTon is a HasTak employee. If you happen to be as lucky as TonTon and find this bewildering figure, be sure to let us know in your area’s sightings forum. Special thanks to Riley Hoffman, Survivefan23, and Powermaster Ultra Prime for all sending this review our way! Seeing as this is our first in-depth look at the figure, be sure to discuss your thoughts on the figure (as well as how TonTon may have acquired the figure) in the forums below, and stay tuned to Seibertron.com for more Transformers news and reviews! Actually, I wouldn't say this came from a retailer...more like from the factory itself, as its just like the case with studio series #38 Bumblebee Movie Optimus Prime...i would think we were supposed to have seen this for the first time at toy fair for a wave 2 leader release. You'd think that, given that this figure and BB Optimus have been so thoroughly leaked at this point that Hasbro would've just done the official "reveal" on social media, like they did back... however long ago now it was they revealed the FOC Combaticons and the likes of Prime Knockout. I mean I know they'll have planned some big Toyfair reveal for these figures, and I'm sure there will be some surprises (Siege Omega being properly revealed fingers crossed) but they have to know by now that the gig is up. These figures exist and anyone who cares knows it. Thanks for the video. He looks ok, I guess. There's just something off about it to me. I think the most distracting part for me would have to be the unpainted "wing wheels" on the outside. I know they were going for the aesthetic of the Cybertron version, but if they were at least not molded to look like wheels on the outside, I think it would have looked better. And I think the "hollowness" of this mold, primarily the cannons, also really makes it standout from the rest of the Siege line. Not necessarily in a good way. Just my two cents. Man, someone at HasTak has got to be pissed. But man, that thing looks good. I rh8nk his rifle is the perfect size to satisfy any fan. As a owner and fan of the Cybertron original, the Siege leader Optimus is a solid PASS for me. It's fake-overkill and it's just a pale hommage to the original. It's even more of a pass because I plan to get Siege leader Ultra Magnus. Still, look like a solid toy for those who don't have the Cybertron original and/or don't plan to get Siege Magnus. I suspect only those interested in the very specific details of the figure, such as wanting a Galaxy Force/Cybertron Optimus or those who just want a Siege Optimus with a super mode. That said, it being a Leader Class Optimus mean it should still do decently at retail in spite of it's flaws. If only his smaller robot head was that of the mouthed Cybertron Optimus. Then he'd actually shoot up a couple point up for me but as he is right now, it somewhat stink of compromise to appease TEH GEEWUN. I'm really tempted to get one for custom fodder, however. Edit: Beside people saying it could work as Nova Prime, I want to turn mine into neo-G1/Aligned Prima by painting him white, light blue and silver. Skritz wrote: I'm really tempted to get one for custom fodder, however. That's a good idea. And the fact that the super mode is 100% partforming open an infinity of possibilities. I like that this figure exists, but I already have the black-ish repaint version wearing the '07 movie Wingblade as a backpack and that is more than good enough for me. Actually, that figure was the first Prime I ever got and is among the first Transformers I ever got at all. Feels kind of weird that it is old enough now to be remade. Honestly, I think TonTon got him from a overseas seller or off of a Ebay seller. Remember with lines like ROTF & Animated? Back in the day, some well known YouTube reviewers like Peaugh got figures early before their release. That, I think, is how TonTon got him.